Flipkart has recently released a teaser confirming the launch date of Moto G5 Plus in India. The phone has been scheduled for 15th of March, 2017 release and will be available for sale from the same day onwards. With a tagline #Only on Flipkart, the same teaser has confirmed the availability of the device only on this particular e-commerce website and the buyers can now register their mail-id to know further about the launch event. By registering their mail-id, one can retrieve information about the specific time of sale. However, it is expected that further queries about the sale will be answered soon as we will progress towards the launch date. Moto G5 has been recently unveiled in the Mobile World Congress 2k17 and has grabbed many eye balls because of its beautiful design. Though a trade-off between the design and the hardware is what experts have to say about the device, the phone’s hardware is not so bad at all. It sports a 5.2 inch Full HD screen with Corning Gorilla Glass 3 that generates a 424 ppi display. Processor wise, it comes with an octa core Snapdragon 625 SoC that beats at max clock speed of 2.0 GHz. Supported by either 2 or 4 GB of RAM and 32 or 64 GB of ROM, the device also comes in color variants namely – Fine Gold and Lunar Grey. Camera wise, a 12 MP primary camera with dual autofocus plus flash and a 5 MP secondary camera with wide angle sensor is also present. It is powered by a 3000 mAh battery and is expected to cost roughly around 15k-18k in Indian currency. Though the design factor and a decent hardware backs the device, the price factor is what seems to keep many users in suspicion. A massive price can cut shot number of buyers. 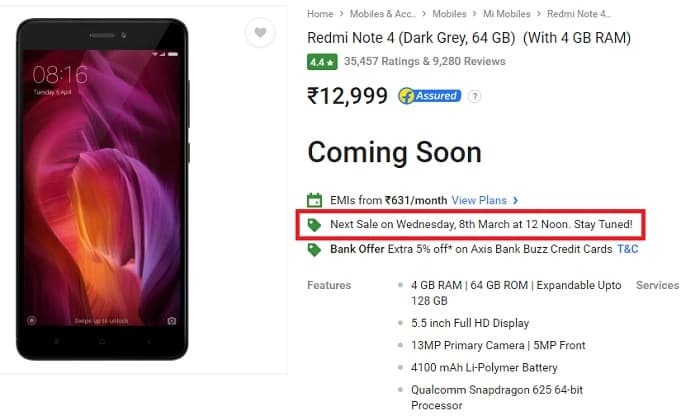 With Xiaomi Note 4 to go on sale on 8th of March on Flipkart, people will opt for the later given that Note 4 offers more specs at a price of only Rs 12,999. However, if the price of Moto G5 Plus fits fine, it will be one of those phones to rule the market this season. For a clear spec information on Moto G5 Plus and Xiaomi Note 4, check out the below tags respectively.